Acne is a common skin disorder that affects the hair follicles and oil glands under your skin. Sebum, which is a substance that your glands produce, will sometimes combine with dead skin cells and create a blockage in your pores. The bacteria within this blockage will then cause swelling and lead to painful, unsightly acne breakouts. At some in everyone’s life, regardless of gender, acne will rear its ugly, pus-filled heads. In fact, 3 out of every 4 people between ages 11-30 experience acne breakouts in their lifetime. There are a multitude of causes for these pesky pimples – including hormonal changes, stress, oily cosmetics, menstruation, diet, and even certain medications. For some, acne is only a minor ailment that occurs when activated by one of these triggers and then dissipates with ease after a short time or is relieved using oral antibiotics or other topical treatments. However, there are many others who are constantly plagued by severe acne breakouts and never seem to be able to find relief, which often eventually leads to acne scarring that can be just as devastating to your self-esteem as it is to your skin. Fortunately, thanks to advancements in the world of cosmetics, there is now an effective acne treatment that can reduce or remove acne scars and give you your life back. Let us introduce you to Endymed! EndyMed Fractional Resurfacing is a non-surgical skin treatment in which brief pulses of radiofrequency are injected deep into the skin built into a specially designed handpiece. The radiofrequency pulses cause a reaction to the locations being treated turn in-turn spurs the body’s natural healing process and encourages the production of new collagen that stretches and diminishes acne scarring. When looking to undergo any cosmetic treatment, surgical or otherwise, it’s important that you find a trusted provider of said treatment in order to receive successful results. In California, the home of the stars, spa facilities, and cosmetic surgeons are a dime a dozen, which can make it difficult to select the right therapist or doctor for you. Remember, an office and a title doesn’t always mean they’re experts in every treatment option on the market. Ensuring that your EndyMed treatments are being performed by a knowledgeable source is essential, and our EndyMed experts at Sepi Spa can help. 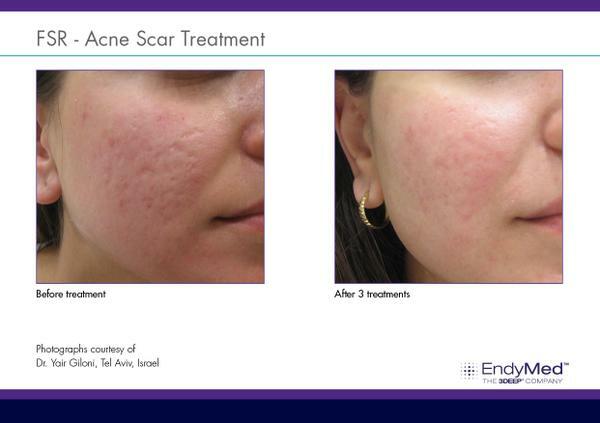 EndyMed has delivered successful results in cases of both mild to severe acne scarring. Acne scars often cause skin discoloration and crater-like patterns on the areas affected, which can result in severe loss of self-confidence and self-worth. Because EndyMed promotes new collagen production and encourages the body’s natural restorative process, the skin will begin to work towards healing those damaged areas. Over time, you will start to notice that the reddish pigmentation and scarring is becoming less and less prevalent, until the blemishes are barely, if at all, visible. The transformations following an EndyMed treatment process are amazing, with patients reporting that not only had their acne scars been greatly reduced, but they also felt as though their overall outlook on life had improved. Additionally, patients also reported mild to no discomfort during treatment – comparing the feeling to a hot stone massage or simply a mild sunburn over the areas where the radiofrequency pulses occurred. EndyMed isn’t always just about repairing skin ailments, it’s also about repairing lives and restoring the confidence and self-worth for patients that undergo treatment. EndyMed Skin Tightening is another form of EndyMed treatment that is known to tighten skin, reduce cellulite, reduce wrinkles, and contour the body. Like other forms, the EndyMed treatment uses non-invasive methods of delivering radiofrequency energy into the skin which stimulates the production of new collagen and improves the overall appearance of skin. The treatment, approved by the Food and Drug Administration (FDA), is praised by doctors and patients alike as being one of the most effective, non-invasive methods of skin tightening currently available on the market. Additionally, many also opt to undergo treatment because it requires absolutely no downtown following the treatment. However, it’s important to remember that result times vary from patient to patient – with some reporting they began to see results as quickly as 1-7 days following their initial treatment, and others stating that it took around 2 weeks before results really became visible. How Much Does EndyMed Cost? EndyMed is relatively cheap in comparison to most surgical cosmetic procedures. Some treatments used to tighten skin or reduce skin blemishes can cost you thousands of dollars. The worst part? These procedures can be dangerous, time-consuming, and may not even work at all. Don’t waste all your hard-earned cash on expensive plastic surgeries and ineffective cosmetic ‘treatments’ when you could just visit the skin care experts at Sepi Spa. The perfect sanctuary for skin care enthusiast and spa-goers alike, Sepi Spa carries some of the most exclusive cosmetic brands and offers customers the most up-to-date spa services and treatments currently available – including EndyMed! In fact, Sepi Spa even offers affordable package deals for EndyMed treatments, such as their face and neck package that contains 5 or 10 treatments. Come in for a consultation and pricing, or call us at 310-998-1958. If you don’t want to buy a package outright, that’s okay! Because Sepi Spa also offers customers affordable single treatments as well. So, if you’re in the Santa Monica area and looking spoil yourself with the ultimate spa day, come to visit your friends at Sepi Spa, located at 1624 Montana Ave, Santa Monica, CA 90403.